I was thinking how lucky I’d been recently in my selection of books for review, with several four and five star ones in a row, then like a kind of book karma I’ve had a run of ones that, while good books in themselves, just aren’t ones I’ve enjoyed for various reasons 😦 This was one such, its a well written book, just not one that held my attention with either plot or characters. I’ve read and enjoyed Michele’s work before so was expecting to like this novel. It didn’t work as well as I expected for me though. Maybe because one of the lead characters is human? I’m not really sure exactly what the problem was, maybe its just a series of minor things rather than one major one that sticks out? It’s just that usually when I’m engrossed in a book I want to stick with it til its finished, and can’t put it down. With this one however I kept putting it down, switching to other books and coming back to it. At one point I even had to go back to the start as I’d forgotten so much of what was important, and that almost never happens…anyway, finally got through it. 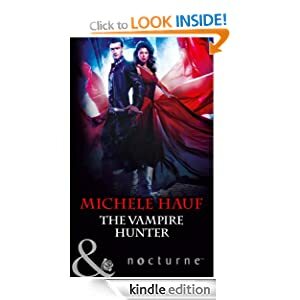 Its Michele’s usual excellent writing of course but the actual plot felt a bit contrived for me, and though the love story between vampire hunter Kas and witch Zoe was sweet that was it – I didn’t feel great passion, strong emotion – all the things I need. I felt for an intelligent witch Zoe was incredibly naïve about the dust she’d been making, and would have looked further into what effects it had, especially once the stories were circulating about the recent problems. Kas, experienced hunter that he was, should have picked up the source far sooner. Of course then we wouldn’t have the book 🙂 so the elements were necessary, but I felt they could have been handled differently and made the whole thing more believable. It was an OK read, fine to pass a few hours, but not one I’d re read. As always though this is purely my view, and if you want a simple, paranormal love story this could well be the read for you. Stars: 2.5 – it was well written and edited of course, but just didn’t work for me.